"Home to Champions - Breeding Champions"
Itsy Bitsy Samsara won 1st Place Jennet and Reserve Grand Champion Model Donkey at the SDMS Spring Spectacular Donkey and Mule Show May 2005 in Corsicana, Texas. Itsy Bitsy Special Occasion won 2nd Place in the Foal and Yearling Class at the December 2004 Texas A&M Donkey and Mule Show, 2nd Place Jennet out of 28 Jennets at the 2005 Fort Worth Livestock Show, and 1st Place in the Foal and Yearling Class at the Houston Livestock Show Donkey and Mule Show in March 2005. 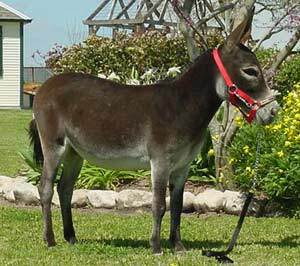 Itsy Bitsy Leading Lady is now a Champion Jennet, she received: 1st in the Foal/Yearling class in College Station, Texas at the TAMU Horseman's Association Show and won Reserve Champion Model Donkey November 2003. Leading Lady was shown by Jerry Willrich and was recently purchased by Tammy McCleney of Paige, Texas. Itsy Bitsy Miss Modena is now a Champion Jennet, she received: 1st NMDA Yearling Jennets to Halter Corsicana, Texas 2003, 1st in NMDA Yearling Jennets to Halter Shelbyville, Tennessee July 2003, 1st ACOSA Miniature Jennets, 2 and under Shelbyville, Tennessee 2003, ACOSA Reserve National Champion Jennet Shelbyville, Tennessee 2003, 1st Foal/Yearling Class Gulf Coast Show Brenham, Texas May 2003. Itsy Bitsy © Coco Chanel's Allure 1st NMDA Jennets to Halter 2 Years Old Corsicana, Texas July 2003, 2nd NMDA Jennets to Halter 2 Years Old Shelbyville, Tennessee 2003, 1st in yearling 2001 Wichita Falls, Texas SWMD Show, 1st in jennets Texas State Fair 2001, 1st in jennets Texas A&M College Station Show 2001, 2nd in jennets Fort Worth Show 2002, 2nd in jennets Illinois International Show 2002, 1st in jennets Corsicana Show, May 2002, 1st in 2 year old jennets NMDA National Show Shelbyville, Tennessee 2002, SMDS Grand Champion Model Miniature Donkey Corsicana, Texas, August 2002. Itsy Bitsy CC Grand Champion Miniature Jennet Houston Show 2002, 1st in Yearlings Illinois International Show 2002, 2nd in Jennets Corsicana Show 2002, 1st in yearling jennets and Grand Champion Jennet and Reserve Best of Breed NMDA National Show Shelbyville, Tennessee 2002, NMDA Grand Champion Jennet, Corsicana, Texas, August 2002. 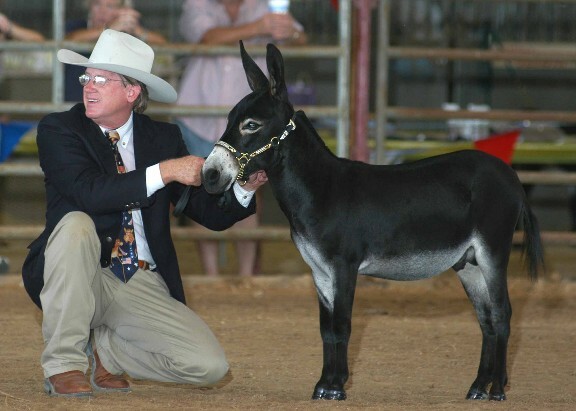 After giving birth to Jet Setter, CC went back to the Houston Livestock Show Donkey and Mule Show and won 1st Place in the Jennet Class in March 2005. Itsy Bitsy MJB Venus Princess 1st in foal class and Reserve Grand Champion Jennet NMDA National Show Shelbyville, Tennessee 2002. 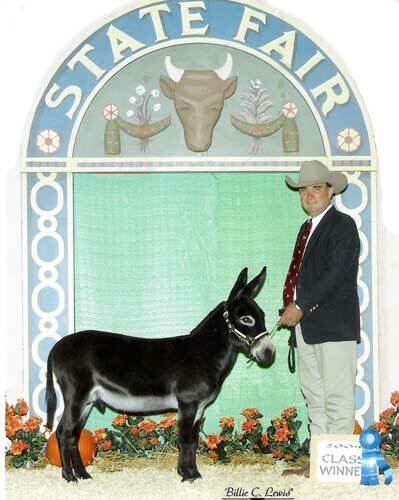 4th in a large class of mature jacks at the Fort Worth Livestock Show Donkey and Mule Show 2005. Itsy Bitsy Jet Pilot 1st NMDA Yearling Jacks to Halter Shelbyville, Tennessee 2003 , NMDA Reserve Champion Jack Shelbyville, Tennessee 2003, Reserve Grand Champion Model Donkey Houston Show 2003. Jet Pilot won 1st Place Jack and Grand Champion Model Donkey at the Houston Livestock Show Donkey and Mule Show in March 2005. Itsy Bitsy © Main Event 1st SDMS Jacks to Halter and Grand Champion Model Donkey Lampasas, Texas Mid Summer Classic Mule and Donkey Show July 2004, NMDA Grand Champion Jack Shelbyville, Tennessee 2003, NMDA Best of Breed Shelbyville, Tennessee 2003, 1st in Jacks and Model Donkey Texas State Fair 2001, Grand Champion Miniature Jack Houston Show 2002, 2nd in Jacks Illinois International Show 2002, 1st in Jacks and Model Donkey Corsicana Show, May 2002, 2nd in 2 year old jacks NMDA National Show Shelbyville, Tennessee 2002, NMDA Grand Champion Jack, Corsicana, Texas, August 2002, SMDS Grand Champion Model Miniature Donkey, Lampasas, Texas, October 2002. Itsy Bitsy Red October 1st NMDA Yearling Jacks to Halter Corsicana, Texas July 2003; 1st in jack class, Grand Champion Model Donkey Corsicana, Texas, June 2003; 1st Place 3&4 year old Jacks and Reserve Champion, Texas State Fair, October 2005. Itsy Bitsy 1/2 Teaspoon 2nd in 2 year old jacks NMDA National Show Shelbyville, Tennessee 2002. Itsy Bitsy Tomcat 1st in Yearlings Corsicana, Texas Show, May 2002. 2004 Supreme Champion Miniature - Congratulations to Tomcat and his owner Kim Stanton!